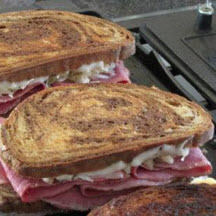 CooksRecipes has quality, kitchen-tested recipes for the traditional Reuben sandwich, as well as tasty new versions of the deli classic. 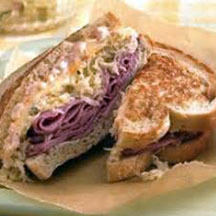 Use deli corned beef or corned beef leftovers from your St. Patrick's dinner to make this classic sandwich. A simple homemade dressing, made with sour cream, chili sauce and just a hint of horseradish, deliciously complements this classic deli sandwich. 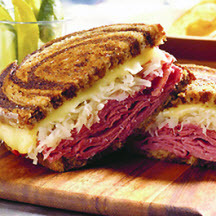 In this version of the Reuben, Havarti cheese takes the place of Swiss, and fresh shredded cabbage replaces the sauerkraut.